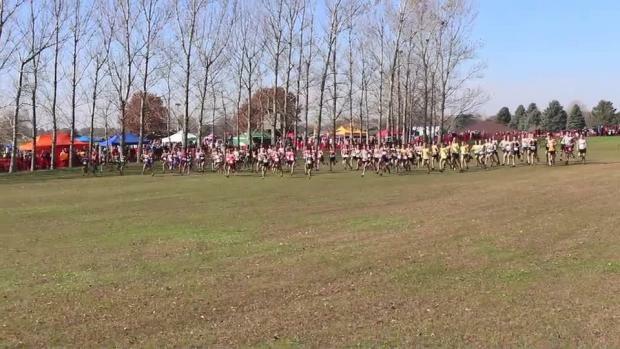 David Holesinger II is a true underdog story, barely breaking the top 100 at his first XC State meet and finishing with a top 5 finish as a senior. With those great improvements, Holesinger was a top recruit for the state of Iowa. 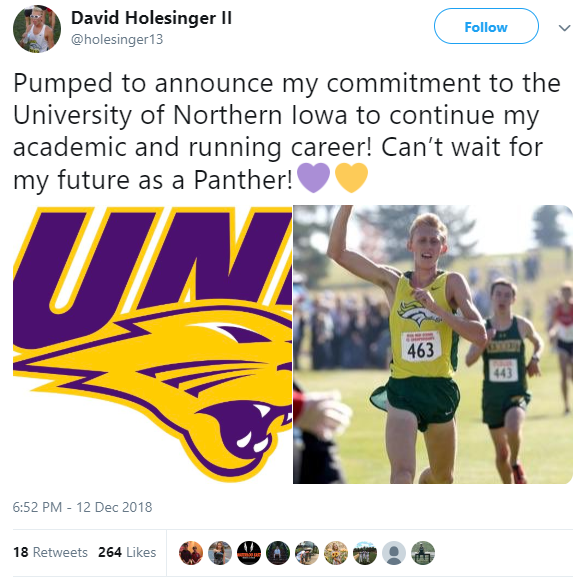 Read on about how he made the decision to sign with UNI and become a Panther this fall! 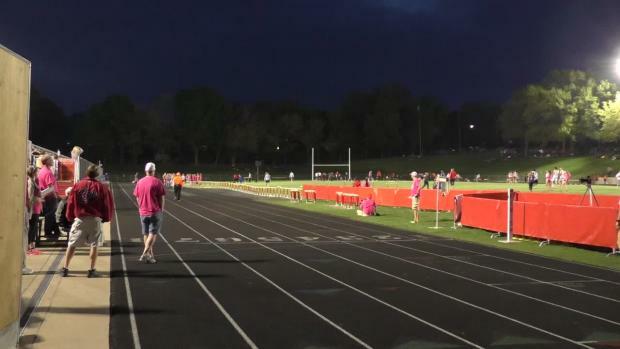 IA MileSplit: You made some big improvements this year in XC, breaking the 16-minute barrier (15:41) and placing top 5 at State. What would you say helped you get to that next level this year? David Holesinger: Consistent training in the off season and having a great coaching staff that believes in me. Also great teammates that push me to be my best. Ryan Winger and Ben Hermiston are always great competitors. IA MS: What are your goals for the upcoming track season? DH: I want to help put my team in position to win meets and races. I also want to be a leader and get the most out of my teammates so I can help breed a very successful track program for the future. IA MS: If you're planning to run any indoor meets, which ones are you planning to compete in and what events? What are your hopes for those? DH: We will run at Ames this year! I am looking forward to the great competition there. I will run whatever sets my team up for the most success. IA MS: When did you start considering running in college? DH: Probably during my junior season of cross country when I started getting recruited to some schools. I realized I could continue doing something I love at a higher level which is amazing. IA MS: What schools were you looking at and how did you choose UNI? DH: My top 3 was UNI, Central College, and Iowa. I chose UNI because the size of the school was perfect for me and the coaching staff is phenomenal. Coach Paulsen and Coach Wilson have both been on the highest level and I know they can get the best out of me. IA MS: Did you take any official or unofficial visits? What were those like? DH: Yes, I did a couple overnights and game-day visits. They were very helpful to see if it would be a good fit for me and what the team is like. IA MS: What is your favorite event to compete in? DH: I love the 1600! IA MS: What events are you looking forward to competing in for UNI? DH: I haven't thought about it too much but I would love to try steeplechase! IA MS: What majors interest you? DH: I plan on majoring in business, but I'm not going to close any doors. I want to have an open mind about the other great options offered at UNI. IA MS: How have your friends/teammates, family, and coaches helped you through this process? DH: My family has always been very supportive and gave me great advice. My teammates have always pushed me to be my best and helped me develop my competitiveness. 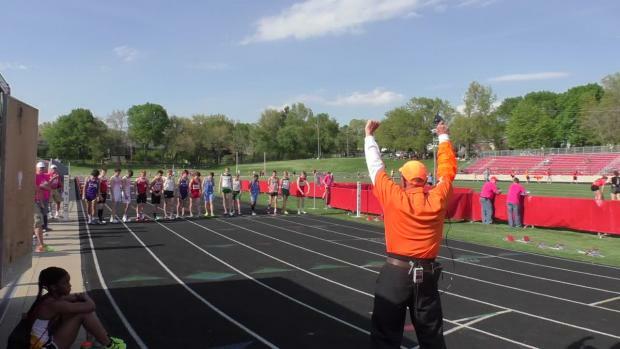 My coaches, especially Coach Ressler have always told me to believe in myself and know I can run with the best in Iowa. This really helped me make my decision to UNI.